Marci Greim holds her Certificate of Clinical Competence in Speech-Language Pathology and is a member of both the American Speech-Language-Hearing Association and the California Speech-Language-Hearing Association. She is licensed as a Speech-Language Pathologist with the CA Speech-Language Pathology and Audiology Board and also has her Clinical Rehabilitative Services Credential for school-based services. 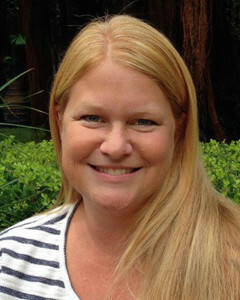 Marci has been a Speech-Language Pathologist in the Solana Beach School District for the past 10 years. She won the Certificated Teacher of the Year Award for the 2009-2010 school year based on votes by colleagues. She specializes in working with preschool and school aged children with a variety of speech and language impairments including autism, developmental delays, phonological delays, motor speech impairment, voice disorders, and delayed language development. She also has specific training in a variety of approaches to and treatments for childhood apraxia of speech (CAS). Marci is PROMPT trained for treating children with speech motor planning challenges. Marci is bilingual (Spanish) and has a special emphasis on evaluation and treatment of Spanish-speaking children aged 2-13. She serves as the district bilingual evaluator in Solana Beach, as well as the coordinator for consultative services for children across the district who speak Spanish. She has provided bilingual assessments for Del Mar Union School District, Cardiff School District, Rancho Santa Fe School District, and Encinitas Union School District as an independent evaluator and consultant. She considers herself an advocate for children and families who have speech and language disorders or delays, especially for those who would not otherwise have a voice. Nicole truly cares about each individual child, and their overall well-being, not just the speech aspect. Nicole takes the time to speak with you about any concerns you may have about your child; whether it’s regarding their speech, difficulties in school, or social issues.